Contact us to share the details of your upcoming event and celebrations! ​Let us know how we did! Please fill out a quick anonymous survey. Wednesday June 6 - 3-6pm - Robert V. Osler Park - Games, pizza, and freezies - bring a blanket! Facebook event with more details and contact info here. ​Thursday May 31 - 3:30-5:30- Nicolanes Bowling Alley located at 2076 Coutlee Avenue. Thursday June 7 - 4-7pm - Lakeside Rotary Park Shelter - RSVP by May 31 to 250 352 3504 -This event will help celebrate children, youth and young adults in and from foster care in our region by bringing them together for positive and fun interactions, both with people familiar to them and an opportunity to meet some new people. Child/youth community service providers will be invited in an effort to build relationships with children/youth with whom they may be connected in future. Wednesday June 6 - Newton Youth Resource Centre (114-13479 76th Avenue, Surrey, BC) - BBQ, Resources, Games, Indoor / Outdoor activities. RSVP by June 1 to Andrea Murphy amurph@pcrs.ca. Thursday June 7 - Chuck Bailey Recreation Centre (13458 107a Ave) - Games, BBQ, Crafts, Surrey Youth in Care Awards, Prizes, and Swag Bags. Supported by the Surrey VIBE Youth Advisory Committee, More info on the Event page - contact Sam Pothier if you have questions or would like to set up a table. Poster available here. ​Federation of BC Youth in Care Network turns 25! 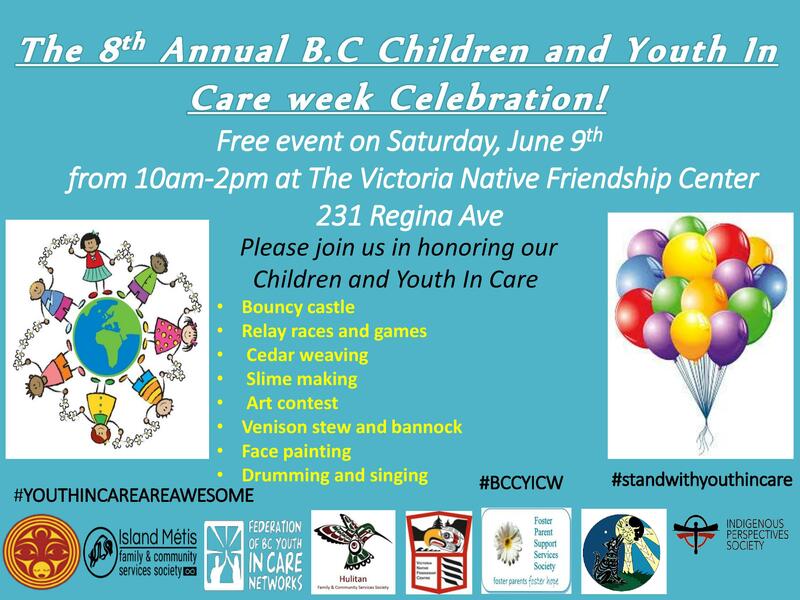 Saturday June 9 - The Victoria Native Friendship Centre (231 Regina Ave, Victoria, BC) - Bouncy castle, games, cedar weaving, slime, art contest, venison stew and bannock, face painting, drumming, and singing! Check out their poster here. ​Monday June 18 - Art Contest Deadline!